We’ve spent some time in the Deck Building 101 series investigating more subtle elements of the game, such as scrying and healing. Now, however, the moment has come to get down and dirty as we wade into a deck ability (a.k.a. “card effect”) that deals with combat. One of the most difficult aspects of the game, especially for new players, is figuring out how you are going to block all those nasty attacks. A necessary aspect of LOTR LCG (though sometimes a thematically wonky one) is that even a basic orc usually has higher stats than most heroes. While there are a few chumps on the other side here and there, most of the time you’re facing down enemies with at least 3 or 4 attack, and this can seem quite overwhelming to deal with when multiple enemies are bearing down and your defensive values don’t seem quite up to snuff. Fortunately, while they may have an army, we have defense buffs. Read on in this entry in the Deck Building 101 series to learn more about these effects and determine which ones will work best for your deck(s). The term “defense buff” refers to any player card effect that increases the defensive strength of a character. As such, they allow you to defend against enemy attacks without incurring damage (hopefully), or at least minimizing the damage that is done. As mentioned in the opening, most enemy attacks exceed the printed defensive strength of your characters, so defense buffs are extremely important to make up the difference. With enemy attack values increasing with each new cycle, this is an area of deck building that won’t go out of style anytime soon. With this in mind, the question is often not whether to include defense buffs, but which ones to include. You can use a defensive strategy that does not revolve around defense buffs, but your chances of being successful without any defensive strategy is minute indeed. As you might expect, most of these defense buffs hail from the Tactics sphere, but there are options for all the other spheres as well. While Elladan is in play, Elrohir gets +2 Defense. 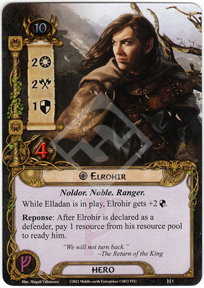 Response: After Elrohir is declared as a defender, pay 1 resource from his resource pool to ready him. The combination of Elladan and Elrohir provides an immediate defense buff from the very first turn that lasts for the entire game (assuming both heroes are kept alive). This is the greatest advantage of this particular option. Perhaps the biggest weakness is that it requires you to take up not one but two hero slots (of course, you do get a simultaneous attack buff for Elladan), which may be problematic depending on the quest and the composition of the rest of your deck. However, don’t ignore the fact that Elrohir’s defense buff is paired with an in-built readying effect that can allow him to take on a strong tank role. In fact, I’m a bit surprised that I don’t see more deck building love for Elladan and Elrohir out there. Use if… You enjoy Elves as a theme. You want a strong defensive character from the start. You are relying on one character to provide the bulk of defense. Response: After you engage an enemy with a higher engagement cost than your threat, ready Sam Gamgee. He gets +1 Willpower, +1 Attack and +1 Defense until the end of the round. Sam Gamgee, as soon as he was released, instantly became one of the strongest heroes in the game. His low threat, strong stats, and useful ability make him a fitting representation of an iconic and loved character. Here, we are mostly concerned with his effectiveness as a card that contains a defense buff, and Sam gains a +1 boost to this stat each time an enemy with a higher engagement cost engages with him. In practice, this usually translates to a buffed defense of 2 (since you can only optional one enemy per turn, and those who engage on their own will usually always have a lower engagement cost) but it can go up even higher if certain encounter card effects force multiple enemies to engage with you at once. This may not seem particularly effective, but Sam works well with Hobbit Cloak, which provides a further buff of 2 against enemies with a higher engagement cost, for a total defense of 4. When taken in the context of a hero with a high willpower who can quest and then still be available for defense (through his readying effect), this defense buff is quite useful. The downside of Sam is that if you have to take on foes with a lower engagement cost, then he soon becomes paper thin as a defender. Another disadvantage is that Sam takes slightly more set-up work than Elrohir, relying on Hobbit Cloak for added effectiveness against stronger enemies. Use if… You are using a Hobbit deck. You want a solid defender from set-up that can also contribute to questing. You are a facing a quest with medium-to-high engagement costs. Eagles of the Misty Mountains cannot have restricted attachments. Eagles of the Misty Mountains gets +1 Attack and +1 Defense for each facedown attachment it has. Response: After another Eagle character leaves play, you may attach that card facedown to Eagles of the Misty Mountains. This strong Eagle ally is well worth its expense. Even without the defense buff provided when Eagle characters leave play, the Eagles of the Misty Mountains starts off with a strong base of 2 defense and 4 hit points. With a single facedown Eagle underneath, which is easy to accomplish thanks to the tendency of Vassal of the Windlord and Winged Guardian to discard themselves, you are looking at an ally with 3 defense and 4 hit points. This is better than most heroes and gives you an idea of the potential power of this card. With a second facedown attachment, Eagles of the Misty Mountains becomes a 4 defense, 4 hit point monster. To put this in perspective, these stats are equal to Beregond’s! The biggest downside of this card as a defense buff and as an overall defensive strategy is that it takes a long time to set up. You must draw this ally, save up 4 resources, draw another Eagle ally, pay for that second Eagle ally and get it out of play, before you can benefit from even the minimum defense buff. In many cases, this takes at least three or four rounds to accomplish, if not more. Thus, Eagles of the Misty Mountains often requires secondary defense buffs/defensive strategies to tide you over. Fortunately, Winged Guardian, which is a component of this set-up in the first place, can work well for this purpose. Use if… You are building an Eagle deck. You haven’t included or don’t want to include a strong defensive hero. You are playing against a quest that starts off slowly. Response: After Arwen Undomiel exhausts, choose a character. That character gains sentinel and gets +1 Defense until the end of the round. Arwen is one of the best allies around in terms of pure value. For only 2 resources, you get 2 points of willpower and 2 hit points, meaning that she can take a point of direct damage from the encounter deck and survive. Beyond her use as a quester, however, Arwen is a strong defense buff effect. While a 1 point boost may seem modest, the key is that her ability can be used every turn, as long as she in play. Since this buff can be used on a different character each turn, Arwen also provides a great deal of flexibility. Even better, this buff is not limited to characters of a certain trait, which adds to her versatility as well. Keep in mind that Arwen’s ability will usually be activated by questing, but it can be triggered any time she exhausts (in theory, if you are able to ready and exhaust her multiple times, you could get multiple uses out of the ability in one turn). I have successfully used Arwen to boost such diverse characters as Defender of Rammas, Beregond, Frodo, and Denethor. She becomes ever better in multiplayer, where her ability to grant “sentinel”, in addition to a defense buff, can be absolutely crucial to cover defensive needs across the board, and is especially useful for granting a defense buff for the Spirit sphere. Use if… You are playing a deck with Spirit. You need a way to grant sentinel to a strong defending character. You want a defense buff that can be given to different characters throughout the course of a game. Each Outlands character you control gets +1 Defense. In an Outlands deck, the Warrior of Lossarnach can quickly become a monstrous force of Gandalf-like proportions. However, unlike the Ethir Swordsman and Knights of the Swan, the Warrior of Lossarnach is of fairly limited utility outside of Outlands builds. As an overall body, the Warrior of Lossarnach is not too shabby for 2 resources. Thinking in terms of a defense buff, though, 2 copies of Warrior of Lossarnach nets you 2 allies with 3 defense and 1 hit point each, all for an overall investment of 4 resources. As defenders, that’s not good for much other than chump blocking, and you have cheaper options for that in the Leadership sphere (Snowbourn Scout and Squire of the Citadel leap to mind). You really need 3 copies to make the whole thing worth it, and without the hit points buff from Anfalas Herdsman, this ally is just too vulnerable to be a reliable defender, especially considering that you need to draw and pay for them all. However, just to emphasize, in an Outlands deck, these guys become pretty amazing and render most defending a trivial matter. Use if… You are using an Outlands deck. You want to try just using Warrior of Lossarnach and Anfalas Herdsman in a non-Outlands build. Response: After a card effect adds any number of resources to the resource pool of a hero you control, Harbor Master gains +1 Defense until the end of the round. Harbor Master is one of the few defense buffs from the Lore sphere, and provides some value in those terms alone. However, this buff only applies to the Harbor Master itself and not to another character, which limits the utility a bit. To make matters worse, Harbor Master’s ability depends upon the triggering of resource generation effects, which are notoriously absent from the Lore sphere. The notable exception is Love of Tales, which is quite limited in its own right, but can become quite effective in tandem with Harbor Master, if 3 or 4 players team up to maximize this combination. Outside of that corner case, Harbor Master is perhaps best used in conjunction with the Leadership sphere, where you can get access to more consistent resource generation. In most cases, you are looking at a defender with 1-2 points of defense and 2 hit points. This is serviceable, but not substantial. Mostly, Harbor Master provides value simply in terms of being a body with a fairly high attack (for Lore). I don’t think Harbor Master can be completely dismissed, as there are ways to deck build to transform this ally into an impressive defender. However, this specificity of deck building means that Harbor Master is rather limited in its flexibility. In addition, even with triggering Steward of Gondor, Wealth of Gondor, and Love of Tales in a single turn, just to take an example, you are only getting a defense of 3 (again, I’m aware that it’s possible to really stack things up in multiplayer games, but that kind of specific combo set-up is the exception that proves the rule). Use if… You are playing a Lore-heavy deck without access to other strong defensive options. You want to try something a little different (like using Love of Tales). You want to explore the possibilities of giving A Burning Brand to an ally. Action: Discard a card from your hand to give attached hero +1 Defense or +1 Willpower until the end of the phase. Limit 3 times per phase. Protector of Lorien is one of the original defense buff effects, and it still can be quite effective. The best aspect of this attachment is that it gives you a great deal of flexibility. You can “spend” just as many cards as you want to get just as much of a defense buff as you need to deal with a particular enemy. Since Protector of Lorien shares a sphere with A Burning Brand, you can easily turn a particular hero into a defender that can scale up to handle even strong foes. Someone like Denethor, for example, can handle the attack of a 6 strength foe turn after turn as long as he has Protector of Lorien and A Burning Brand attached, along with cards to burn. Of course, this latter requirement is the primary weakness of this attachment. You have to sacrifice cards to make it work consistently, compared to some of the other attachments that permanently boost defense. However, fortunately the Lore sphere has a ton of card draw available, and you can include multiple copies of unique cards to serve as discard fodder. Also keep in mind that the ability to use this attachment for questing as well gives it an added dimension of flexibility over similar effects. Use if… You want a defense buff for the Lore sphere. You plan on running a strong card draw engine. You want to combine a defense and willpower buff in a single attachment. Attached hero gains +1 Defense. Action: Pay 1 resource from attached hero’s pool to attach Dunedain Warning to another hero. Dunedain Warning provides a nice defense buff for the Leadership sphere. Paying 1 resource for an extra point of defense is perfectly reasonable, and compares favorably with other defense buff effects. An advantage of Dunedain Warning is that it is not restricted, so you can easily combine it with other attachments without limit, and can even stack it together with other copies of itself. One aspect of Dunedain Warning that is often forgotten is its built-in ability to transfer between heroes. Note that since this is an action, you could actually transfer this attachment to a hero after a shadow card has been revealed, possibly protecting them against a shadow effect that increases an enemy’s attack strength. This transfer ability also provides some flexibility, if you end up needing to move this defense buff between heroes, which may happen in multiplayer. Generally, though, Dunedain Warning will sit on one hero throughout a game. Use if… You are running a Leadership-heavy deck and need a defense buff. You want the flexibility of transferring a defense buff. You want to experiment with an unconventional form of shadow mitigation. Attach to a Tactics hero. Action: Exhaust Support of the Eagles to choose an Eagle ally. Until the end of the phase, attached hero adds that ally’s Attack or Defense (choose 1) to its own. Support of the Eagles is one of the most expensive defense buffs around. On the other hand, it is also potentially the most powerful. The easiest and best use of Support of the Eagles (as a defense buff) is to use it to add the Winged Guardian’s 4 defense to the attached hero. This can transform someone like Beregond into a 8 defense monster or a readying machine like Boromir into a 6 defense wall. Of course, this attachment can also add a powered-up Eagles of the Misty Mountain’s defense to a hero, but the Winged Guardian combination is much more efficient and easier to set up. The downside of Support of the Eagles is its initial expense and the relatively long time it takes before it’s operational (drawing both Support of the Eagles and Winged Guardian and getting both into play). An added bonus of Support of the Eagles is that it can flexibly provide attack boosting as well, and its ability to bolster siege questing efforts is potentially game-changing. Use if… You are running an Eagles deck. You want a stronger dose of defensive buffing than other effects can provide. You are facing a quest with siege stages. Attach to a Dwarf or Hobbit character. Restricted. Attached character gets +1 hit point and +1 Defense. Ring Mail is one of the few armor attachments in the game, and it not only raises a character’s defense, but also its hit points as well. For 2 cost, this is a pretty good deal, and can often make the difference in transforming a passable defending hero into a more reliable option (note that Ring Mail also allows for the possibility of upgrading an ally, but 99.9% of the time, it is best placed on a hero). There are some limitations and weaknesses to this attachment, however. First, it is limited to only Dwarves and Hobbits, which immediately means that it will be excluded from many decks. Second, it is restricted, which may interfere with the ability to pile on other attachments. Third, it is a bit expensive when compared to some of the other defense buffs, although the cost can be justified in terms of what it provides. Still, for Dwarf and Hobbit decks, Ring Mail is a great option when you’re searching for a defense buff. Use if… You are running a Dwarf or Hobbit deck. You want to run a character that needs to take damage, such as Gimli or Gloin. You want a quick defense buff without too much set-up time. Attach to a Gondor or Dúnedain hero. Blood of Numenor is perhaps most notable for providing a strong defense buff option for the Spirit sphere. It does have substantial limitations. Most obviously, it can only be used by heroes with the Gondor or Dunedain trait, although this can be easily circumvented with the use of Steward of Gondor’s magical Gondor-granting ability. The more serious weakness is that Blood of Numenor requires a pool of resources on the attached hero to be effective, and Spirit isn’t necessarily the best sphere for resource generation. Still, there are ways to make Blood of Numenor quite effective. If you use attachments like Steward of Gondor, Horn of Gondor, and/or Resourceful on a hero with Blood of Numenor, they can soon be defending with a strength of 6, 7, 8, or more! So while Blood of Numenor requires set-up time and other cards to be effective, it has a ceiling that is much higher than almost any other defense buff. In fact, the only ceiling is the number of resources that you can pile onto a single hero. Of course, those resources are lost for other purposes, but Blood of Numenor does provide flexibility in that you can uses its ability only when needed, and can scale the number of resources in the attached hero’s pool to the attack power of the enemies in the scenario. 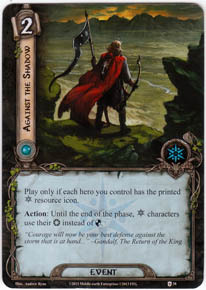 Keep in mind that Blood of Numenor can be used to boost a hero’s defense after shadow cards are revealed, meaning that you can spend that resource only if it’s really needed in some cases. 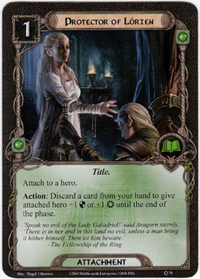 Use if… You are using a Gondor or Dunedain hero that will be the main defender. You are including resource generation effects. You need to take on extremely strong enemies or a boss. Attach to a hero. Restricted. Limit 1 per hero. I’ve sung the praises of Gondorian Shield nearly endlessly since it was released, so I won’t belabor the point here. This amazingly cheap attachment grants 2 points of extra defense for a character with the Gondor trait. 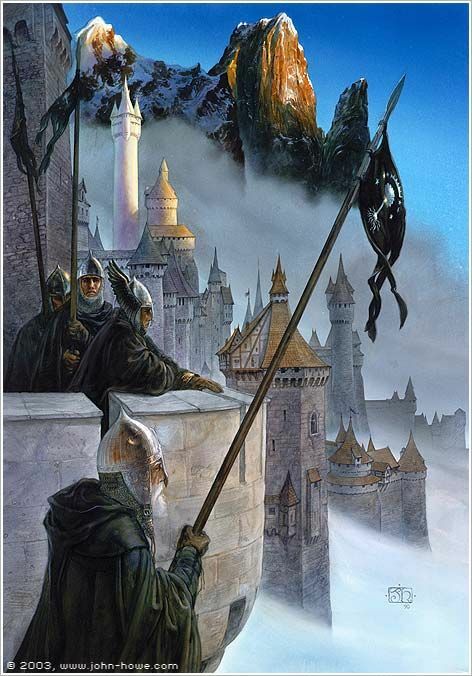 This may seem like a substantial limitation, but many of the best defenders have the Gondor trait, and it is easy enough to put the Steward of Gondor on a character so that they can benefit from the full bonus. Even on a non-Gondor hero, a defense buff of 1 for a cost of 1 is equivalent to a card like Dunedain Warning. Although an extra point of defense above 1 might not seem too dramatic a difference, the incremental effect actually feels exponential. In other words, the gap between 1 point of extra defense and 2 points of extra difference is larger than it appears. With Gondorian Shield and a strong defending hero, you can safely and consistently defend even the strongest attacks. This solves a ton of defensive problems in the game. The only true downside of this attachment is that it has the “restricted” keyword, but your true “tanks” won’t be needing a ton of restricted attachments anyway (which often tend to be weapons). Use if… You are using a Gondor hero as your main defender. You want to turn any hero into a strong defender (in combination with Steward of Gondor). You are facing a scenario with high attack enemies. Attach to a Hobbit hero. Limit 1 per hero. Attached hero gets +2 Defense while defending against an attack by an enemy with an egagement cost higher than your threat. At first glance, it may be tempting to think of Hobbit Cloak as the Shire version of Gondorian Shield. However, this is a very different attachment in practice. It is cheap (1 resource) and provides a substantial defense buff (2 extra points), which can transform a Hobbit hero like Sam into a bona fide defensive option. This can be crucial for a Hobbit deck, especially since most of your heroes will only have 2 or 3 hit points. However, Hobbit Cloak is inferior to Gondorian Shield in a couple of respects. First, it can only be attached to Hobbit heroes, whereas Gondorian Shield provides some kind of bonus even if a character doesn’t have the specified trait. Second, Hobbit heroes are naturally worse defenders than Gondor heroes. Third, and most damning of all, if an enemy with a lower engagement cost manages to get to grips with you, then the Hobbit Cloak will feel about as useful as a paper napkin for keeping your hero safe. All of this is not to say that Hobbit Cloak is not useful, because it absolutely can make a significant difference in a Hobbit deck. Sam in particular can make great use of this attachment to become a strong defender. It just means that threat management and threat reduction become important priorities if you want Hobbit Cloak to work consistently, and it may not work at all against scenarios that feature low engagement cost enemies. Use if… You are running a Hobbit deck. You have a low starting threat and/or threat reduction effects. You are using Sam Gamgee. Action: Until the end of the phase, all characters get +1 Attack. All Gondor characters also get +1 Defense until the end of the phase. There are quite a few effects that provide a global boost to willpower or attack. However, global defense buffs are a bit more rare. For Gondor! is a notable exception, although the global defense buff is limited to Gondor characters (and is paired with a global attack buff). Certainly, this card can be useful if you find yourself suddenly swarmed with enemies. However, it is also expensive at a cost of 2 resources. In general, I would prefer to spend those resources to permanently build up one character as a strong defensive option, rather than to temporarily add a single point of defense to a bunch of characters, most of whom won’t substantially benefit from the boost to the point where it matters much (again, I’m mainly focusing on the defense buff here, not the benefit to attack). As such, this card provides a nice benefit if you’re going to use it anyway for attack purposes, and it can serve as an emergency option or a supplement to other defense buffs, but I would probably look elsewhere for defensive help (note that siege stages are an important exception). Use if… You are running a Gondor deck. You plan to use several different characters for defense. You are facing a quest with siege stages. Action: Choose a character. Until the end of the phase, that character gains +1 Attack and +1 Defense. This is a card that doesn’t see much use these days, although it showed up more in the early days of the game. The biggest advantage of this card is that it is a utility card that can be used when needed to bolster both attack and defense (this could be particularly handy for characters that can ready and participate in both parts of combat). As such, it is probably best understood as a supplement to other defense buffs, and can play a role in neutralizing a shadow effect or providing a last point of defense to keep a character alive against a strong enemy. The downside is that the effect is only temporary. You could pay the same cost (1 resource) and get a permanent 1 point boost to defense with Gondorian Shield. Use if… You want a form of alternative shadow cancellation. You have a character that can both attack and defend. Action: Choose a player. That player may declare any number of his eligible characters as defenders against each enemy attacking him this phase. While not directly boosting a character’s defense, Stand Together acts as a defense buff by allowing characters to pool their defense together. This sounds like a cool and useful ability in theory, but it doesn’t work out so well in practice. Action advantage is one of the most important elements in achieving victory, so giving up the actions of two or more characters to defend against a single enemy is usually not feasible or advisable. The exception may be if you control a readying character like Tactics Boromir, who could add his 2 defense to the defense of all other characters (for the cost of threat). Still, these uses are the exception and there are just much better options in the card pool now, as witnessed by the entries in the rest of this article. Use if… You don’t have a single strong defender. You have a limited card pool. Action: Choose a Dwarf hero. That hero gets +2 Willpower, +2 Attack, and +2 Defense until the end of the round. Durin’s Song is a strong event that buffs all the stats of a single hero, except hit points. This ability is limited to Dwarven heroes, but once you get past that limitation, this is a must-include for most Dwarf decks. Gaining an additional 2 points of defense for only 1 cost is definitely worth the resources and deck space, as this may allow a Dwarven defender to counter an especially nasty foe or help to cancel out a shadow effect with a strong attack boost for the enemy. Here again, it becomes apparent that a +2 buff is so much more meaningful than a +1 buff. Some may look at this event and wonder why it would boost willpower, attack, AND defense, as it is highly unlikely that one character will be able to make use of all of those stats. However, the key here is that it provides flexibility, and even if the defense buff never is needed, you can use Durin’s Song for attacking or questing instead. In short, you’ll never be sad to have Durin’s Song in your hand. Note also that as a song, this event can be retrieved by Rivendell Minstrel and will trigger Love of Tales to pay for itself. Use if… You are running a Dwarf deck. You want to include a flexible stat buff. You are facing a scenario with shadow attack boosts and/or strong enemies. Action: Ready a defending Gondor character. That character gets +1 Defense until the end of the phase. Behind Strong Walls is a useful Tactics event in that it combines a defense buff with a readying effect. Thus, not only are you able to make a strong defender even better, you are able to use that defender to guard against multiple attacks in the same turn. This is especially useful in a sphere that is starving for readying effects, so Behind Strong Walls should get strong consideration (sorry, couldn’t resist) in any deck that uses a Gondor character as the primary defender. 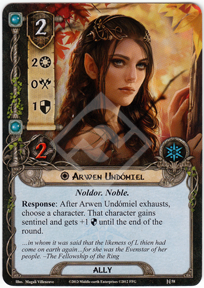 This trait limitation is the main drawback of this card, although this can be dodged, as always, through the use of Steward of Gondor, and Gondor has some of the strongest defensive characters around anyway. Use if… You are running a Gondor deck. You are using a Gondor character as your primary defender. You need readying for your Tactics deck. Action: All characters get +2 Defense and do not exhaust to defend until the end of the round. The power of this event is not debatable. To give just one example, Beregond with a Gondorian Shield could use Light the Beacons to defend against every single attacking enemy on the board with a defense strength of 8! This is an almost absurdly strong effect that can turn the tides of battle single-handedly. It as if every character on the board suddenly was equipped with a Gondorian Shield and could defend at will. However, Light the Beacons comes with a formidable limitation, which is its extreme expense (5 resources). The cost is quite justifiable, and I wouldn’t want it to be any cheaper from the perspective of game balance. Still, it does ensure that this card doesn’t get included in decks or hit the table as often as many other defense buffs. This is practically a late game card, and as such, it may not often make the cut compared to cards that have a more immediate impact. It is possible to cut down the cost of this event with something like Good Meal (this would reduce it to a quite affordable 3), but many times, it is enough to build up one or two defensive options and Light the Beacons may be overkill in those situations. Use if… You are facing a quest with a ton of enemies. You are facing a quest with a difficult final stage. You are running Good Meal. Play only if each hero you control has the printed Spirit resource icon. Action: Until the end of the phase, Spirit characters use their Willpower instead of Defense. I debated including this card in an entry on defense buffs, but since it functionally serves as a means of boosting the defense of Spirit characters, I feel it qualifies. The possibility of turning a high willpower character like Eowyn into a 4 defense colossus seems intriguing on the surface, and Against the Shadow certainly gives a defensive option for mono-Spirit decks that might otherwise struggle with dealing with enemy attacks. However, I’ve found that I always end up either cutting this event or watching as it sits unused in my hand. Generally, Frodo and Blood of Numenor both turn out to be better defense buffs/options for a mono-Spirit deck than Against the Shadow. The problem is that characters with high willpower are usually going to be questing, not being held back so that they can defend. Sure, there’s plenty of opportunity in the Spirit sphere to ready characters, and I could imagine an Eowyn/Unexpected Courage/Against the Shadow combo with recycling provided by Dwarven Tomb/Map of Earnil working for an intrepid deck builder, but the jury remains out on this card. The exception is siege questing, and Against the Shadow can be useful to allow a mono-Spirit deck to actually be somewhat effective against a quest with siege stages. Use if… You are running a mono-Spirit deck against a quest with siege stages. You want to experiment. You lack other defensive options. Action: Choose a Hobbit character. That character gets +2 Willpower, +2 Attack and +2 Defense until the end of the phase. This is essentially Durin’s Song for Hobbit, so I will direct you to my comments for that event. To summarize, this is a great event, and a must-include for most Hobbit decks. 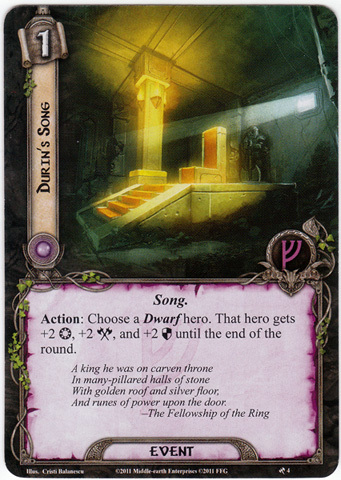 One special function of this card, compared to Durin’s Song, is that it can provide a back-up plan against those enemies that can tear through a Hobbit Cloak. 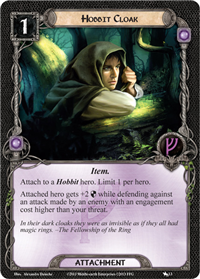 Use if… You are running a Hobbit deck with access to Tactics. You want to include a flexible stat buff. You are facing a scenario with shadow attack boosts and/or strong enemies. As you can see from the length of this article, there are plenty of options when it comes to choosing defense buffs for your particular deck. 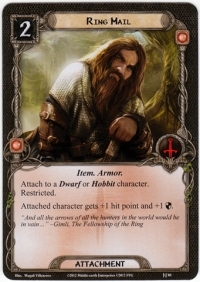 Some of your choices will be determined by trait, as a Dwarven deck will likely be drawn to Durin’s Song and Ring Mail, a Hobbit deck will be enticed by Hobbit Cloak and Halfling Determination, and a Gondor deck will gravitate towards Gondorian Shield and Behind Strong Walls. Whatever trait or deck type you want to run, though, I wouldn’t recommend neglecting defense buffs altogether, if at all possible. So peruse the list, choose the ones that match your needs, and remember that Gondorian Shield is the best thing since fresh lembas. Until next time, keep an eye out for the next edition of the Deck Building 101 series! Blade Mastery also works wonderfully with Elrohir! That’s a good one. I’m going to get around to making a new Elrohir/Elladan deck now that the card pool has expanded some more. Let’s see if I can find some room for Blade Mastery! Attack and defense buff event cards became more fun to include in your deck after Siege and Battle quests entered the game. That makes cards like For Gondor! so much more flexible. I would love to see some defense events that are similar to the very nice attack boosts provided by cards like Khazad! Khazad! and Unseen Strike (although the latter can’t be used for questing). Behind Strong Walls is a good start in that department. An epic +3 to defense event card would certainly be nice. I agree about the siege and battle quests. I’ve seen a few people out there say they don’t like them, but I really enjoyed how they impacted old cards and old strategies. I hope they are continued into future cycles. Stand together is nice if you have army of gondorian spearmen and characters with spears of the citadel. And it is perfect combo with Light the Beacons and Hammer-Stroke. I’ve dreamt of building the epic Gondorian defense deck to end all Gondorian defense decks, and the combo you mentioned would certainly be a centerpiece. It’d be an interesting deck building challenge to try to make this combo work as consistently as possible. 2 copies of Warrior of Lossarnach nets you 2 allies with 2 defense and 1 hit point each. With 2 copies on the table each would be at 3 def right? They start with 1 def, and when you play the first he is up to 2 def, the second copy they will be at 3, and the third copy they will be at 4. At least that’s the way i interpreted the outlands buffs. Nope, you’re right. That was a typo, and it should be fixed now. Thanks! I find that defense is less needed the more I play. Allies provide more versatility and it seems that many quests can simply be ‘quested’ through, minimizing the need to engage powerful or multiple enemies. I have even gone so far as to remove Forest Snares opting for the single turn Feints instead. I’m still in the early stages of the game, I just got it about a month ago and am actually about ready to expand to another expansion; any suggestions? Defense definitely plays second fiddle to questing throughout the MIrkwood and much of the Dwarrowdelf cycle. I would say that Heirs of Numenor/Against the Shadow really brought the importance of defense back to the forefront. As for expansions, if you haven’t yet seen the buying guide here under the New Players Guides tab, you should check it out. What are you looking for in your next expansion? Strong player cards? Fun quests? A good challenge? I had a question about Elrohir and Elladan’s ability and couldn’t come up with a better place to post it. I just got the Road to Rivendell AP and played with them for the first time last night. Can either of the twins exhaust to quest, then pay a resource to ready themselves for attack/defense? I wasn’t sure how this ability is supposed to work. Any insights would be appreciated. Thanks! Hi Erebor. Unfortunately, you can’t use Elladan or Elrohir’s ability to ready after questing. Elrohir can only ready right after declaring as a defender, while Elladan can only ready right after declaring as an attacker. I saw that, but I was wondering if anything prevents you from “declaring” an exhausted character as an attacker/defender. Ordinarily, that wouldn’t accomplish anything, but with the twins… ? Ah, I see what you mean. The official ruling that has come down is that an exhausted character cannot be declared as an attacker/defender (or for questing for that matter). Note that this is true even if that characters has the ability to do an action without exhausting. For example, hero Beorn has the ability to defend without exhausting, but if he already exhausted, he can’t defend.